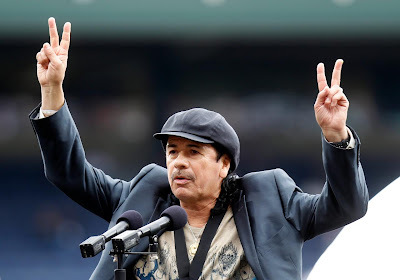 Grammy-winning rock legend Carlos Santana was given the Major League Baseball Beacon of Change Award before Braves-Phillies game Sunday, May 15, 2011, in Atlanta. Photo by John Bazemore / AP. ATLANTA -- Major League Baseball’s annual Civil Rights Game was poised to be a migraine-inducing exercise in Orwellian irony. Forget about the fact that Civil Rights was to be honored in Atlanta, where fans root for a team called the Braves and cheer in unison with the ubiquitous "tomahawk chop." The reason Atlanta was such a brutally awkward setting for a Sunday Civil Rights event was that Friday saw the Governor of Georgia, Nathan Deal, sign HR 87, a law that shreds the Civil Rights of the state’s Latino population. Modeled after Arizona’s horrific and unconstitutional SB 1070, HR 87 authorizes state and local police the federal powers to demand immigration papers from people they suspect to be undocumented. Those without papers on request will find themselves behind bars. Civil Rights hero John Lewis of Atlanta has spoken out forcefully against the legislation, saying “This is a recipe for discrimination. We’ve come too far to return to the dark past." But there was Major League Baseball commissioner Bud Selig, celebrating civil rights in Georgia, and chortling excitedly about the 2011 All-Star game in Arizona. In the hands of Selig, irony becomes arsenic. But Bud picked the wrong Latino. Carlos Santana took the microphone and said that he was representing all immigrants. Then Santana added, "The people of Arizona, and the people of Atlanta, Georgia, you should be ashamed of yourselves." In a perfect display of Gov. Nathan Deal’s Georgia, the cheers quickly turned to boos. Yes, Carlos Santana was booed on Civil Rights Day in Atlanta for talking about Civil Rights. This law is not correct. It's a cruel law, actually. This is about fear. Stop shucking and jiving. People are afraid we're going to steal your job. No we aren't. You're not going to change sheets and clean toilets. I would invite all Latin people to do nothing for about two weeks so you can see who really, really is running the economy. Who cleans the sheets? Who cleans the toilets? Who babysits? I am here to give voice to the invisible. Most people, at this point, they are either afraid to really say what needs to be said. This is the United States, the land of the free. If people want the immigration law to keep passing in every state then everybody should get out and just leave the American Indians here. This is about Civil Rights. Where was Bud Selig during all this drama? It seems that Selig slunk out of a stadium backdoor in the fifth inning. If there is one thing Bud has become an expert at, it’s ducking his head when the issues of immigration, civil rights, and Major League Baseball collide. If Selig really gave a damn about Civil Rights, he would heed the words of Carlos Santana. He would move the 2011 All-Star Game out of Arizona. He would recognize that the sport of Jackie Robinson, Roberto Clemente, and Curt Flood has an obligation to stand for something more than just using their memory to cover up the injustices of the present. If Bud Selig cared about Civil Rights, he would above all else, have to develop something resembling a spine. But if Bud is altogether unfamiliar with the concept of courage, he received one hell of an object lesson from Carlos Santana.